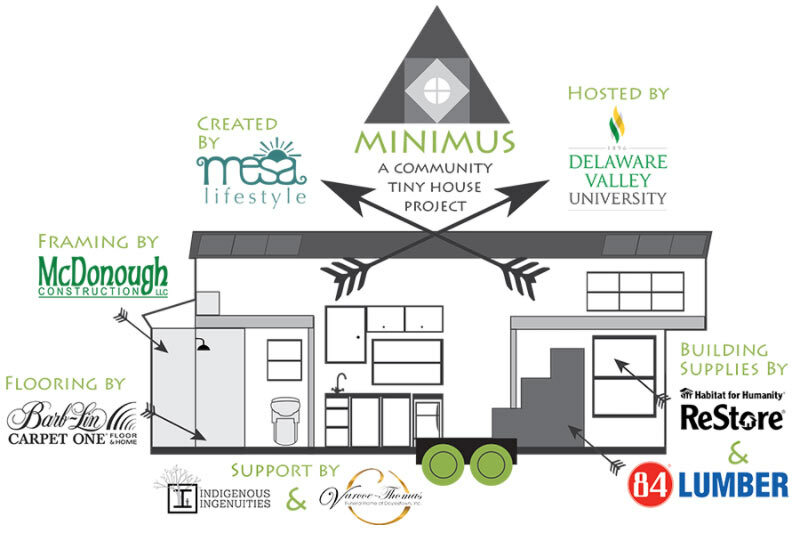 Minimus is a mobile, tiny house project designed to inspire a more Earth-conscious community. The Minimus team demonstrated the building process of a fully functional, off-grid living space while educating the community on how to integrate sustainability. Minimus will be about 270 sq. ft. including the sleeping loft. She was built on a 8x26 ft. trailer. She is solar powered, with a rain water catchment and filtration system, using a compost toilet. The Minimus exterior is a sleek, modern asymmetrical design, with and a side entryway. It's interior has a rustic, modern feel with plenty of natural light. The open floor plan includes a kitchen, living area, full bathroom, walk in closet, and a storage staircase leading to a lofted bedroom. Minimus was open to the public every Saturday in September & October, 2017 from Noon to 4pm. In the future, the public will be able to take a full tour of the home and have an opportunity to speak with sustainability experts, project sponsors and other community members interested in a more sustainable way of living. Sustainable Saturday were free and open to all. Minimus was at the Market at Delaware Valley University in Doylestown, PA.